Another view of the Atlantic Avenue Bridge. Well-designed fenders braced with battered piles protect the bascule piers from errant vessels. A sign on the far fender gives the name of the bridge. A second sign on the railing gives the VHS Channel (9) to notify the operator that a vessel is approaching. A third sign notifies sailors that the bridge will open on the 1st and 3rd quarter of each hour. Stop lights (and hanging lamps) alert boaters that the bridge is closed. Signs on each pier inform approaching ships that they are in the City of Delray Beach. The bridge is surrounded by palms, sea grapes, and other tropical vegetation. 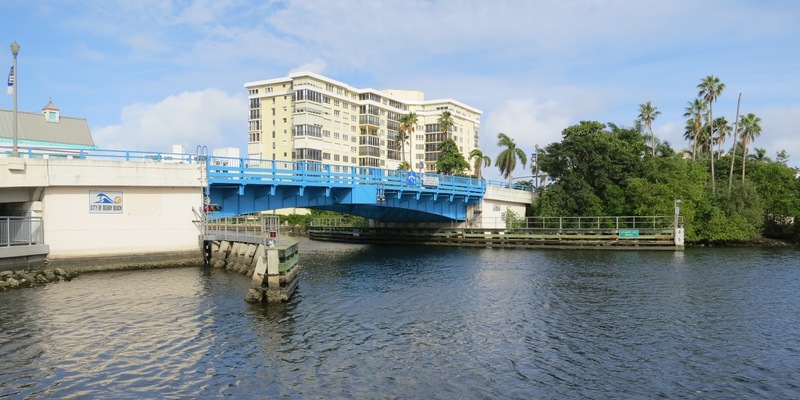 Palm Beach County, Florida Bridges: Atlantic Avenue Bridge across the Intracoastal Waterway (2) by Mark Yashinsky is licensed under a Creative Commons Attribution-NonCommercial-ShareAlike 3.0 United States License.